This is the homepage of the PDP-8/E Simulator, an emulator for the Digital Equipment PDP-8/E minicomputer running on the Apple Macintosh. The simulated machine is a PDP-8/E with 4K words of memory and optionally a KM8-E Memory Extension (with up to 32K words of memory) and a KE8-E Extended Arithmetic Element. I/O devices are implemented as plug-in modules, and plug-ins for an ASR 33 Console Teletype, an ASR 33 Auxiliary Teletype, a PC8-E High Speed Paper Tape Reader and Punch, and a RK8-E Disk Cartridge System are available. There is also a KC8-EA Programmer's Console plug-in enabling the user to operate the simulator (nearly) like a hardware PDP-8/E, including single step execution on memory cycle level. Furthermore, the simulator has a plug-in for the TSC8-75 board so that the emulated PDP-8/E can run the ETOS time sharing operating system. The simulator provides a comfortable user interface for running, writing and debugging PDP-8 software. For each device, there is a separate window which displays the internal state of the device. The user can view and edit the PDP-8 memory content as octal dump, assembler instructions and typed data (ASCII, integer, floating point,...). Other features of the simulator are breakpoints, break opcodes, single step execution, a trace mode for the PDP-8/E and much more. The emulated ASR 33 Teletypes provide all comfort of Macintosh text editor windows and optionally produce the sound of hardware typewriters. Benchmarks show that the PDP-8/E Simulator outperforms a hardware PDP-8/E in orders of magnitude when running on reasonable current Macs. There are options to slow down the CPU and the I/O devices to the speed of the real hardware. The simulator passes all of the most important MAINDEC hardware diagnostics for the PDP-8/E. The plug-in API is included with the download, as well as a Memory Content demo plug-in that graphically shows the PDP-8/E memory content of the running machine. So you can implement your own plug-ins and PDP-8/E devices using Xcode and Cocoa. PDP-8/E Simulator 2.1 runs on any PowerPC or Intel Mac with Mac OS X 10.4 “Tiger” or better and supports 64-bit mode and macOS 10.14 “Mojave” Dark Mode. It is a Cocoa reimplementation of the version 1.x for the “classic” Mac OS that was first released in 1994. This version in turn is based on the PDP-8/E emulator of Bill Haygood (out-dated version from 1993). All three emulators use the same well-proven PDP-8/E emulation engine. The simulator package includes some PDP-8 software, e. g. a complete OS/8 system, FOCAL-8 and Pascal-S and a PAL-8 compatible cross-assembler. There are tutorials for a quick start with the PDP-8/E Simulator and for operating the KC8-EA Programmer’s Console. For older Macs, there is still PDP-8/E Simulator 1.5.1 available that runs on 68K-, PowerPC- and Intel-based Macs with System 2.0.1 to Mac OS X 10.6 “Snow Leopard”. 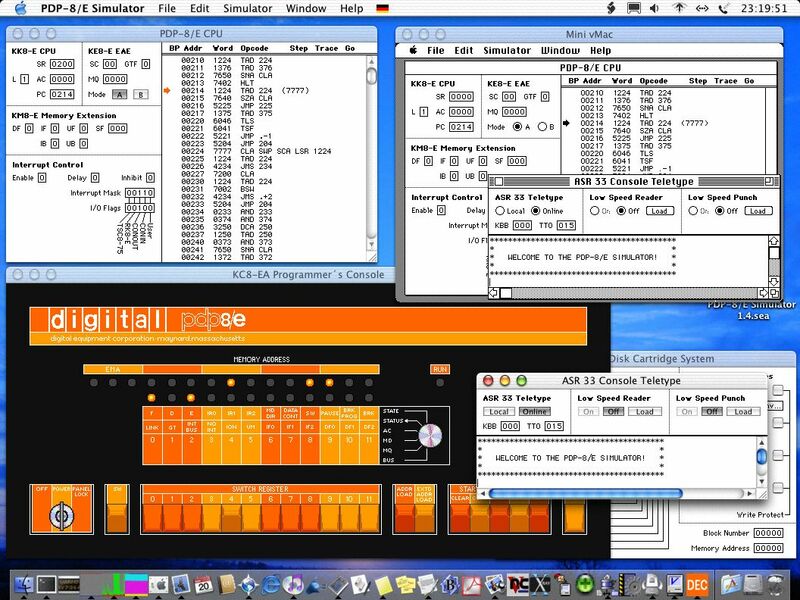 The screenshot at the left shows the simulator simultaneously running on Mac OS X 10.2 “Jaguar” and on a Mac Plus with System 2.0.1. The Mac Plus “Mr. T” is emulated by Mini vMac. This is the quick start for PDP-8/E Simulator 1.x. Note that PDP-8/E Simulator 1.x and the I/O devices can completely be controlled using AppleScript. Read the history of the PDP-8/E Simulator and some user feedback. Here are some Links to other PDP-8 related resources. The PDP-8/E Simulator is published under the conditions of the GNU General Public License.